David Altmejd talks about the work Le Trou. Le Trou (The Hole) is a piece that I made for this context, for this show. 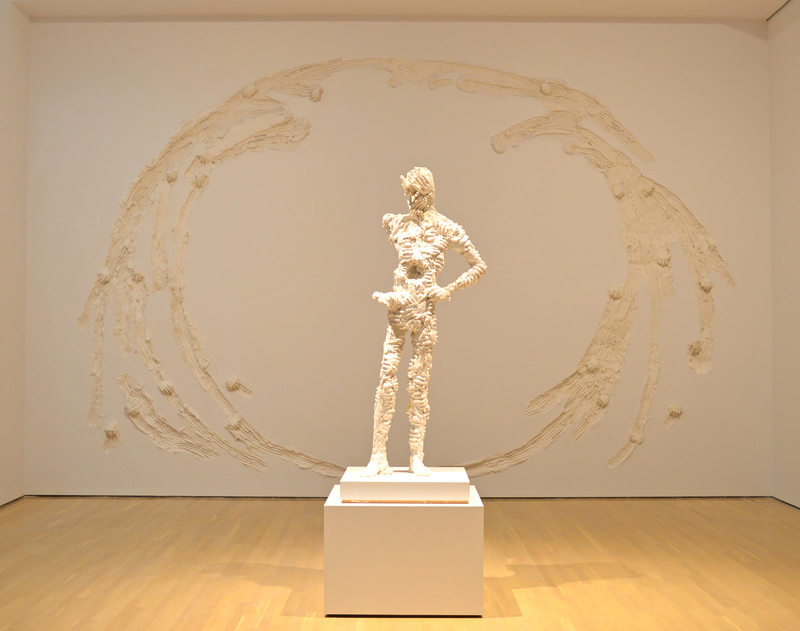 Because it’s really important for me to activate space, to make it so that when you travel through a show you don’t only see sculptures here and there, but that the whole space feels like it’s activated, that it has holes, that there is energy coming from the walls that bounces on the sculptures, that travels. I think that it makes the whole experience of the viewer a much more dynamic one. So it was important to have that moment of energy in the wall. I made that piece for the context because I knew that there were going to be a few plaster pieces and I wanted to transfer that energy in the walls. So I used the same principle, the same concept, which is using casts of my hands and using them to drag the material that comes from the wall itself, and reshaping a completely new shape. I decided to call it a hole because it’s not a hole. I really like these contrasts, I like the reverse. You know, it’s not a hole, because when you look at it, actually what the hands are doing is that they’re digging a circle. If they wanted to dig a hole, they would actually dig in the middle. That’s the reverse of a hole. What I end up with is a big, large surface that’s flat and closed, so it’s the opposite. But that’s what I thought was exciting, to refer to it as what it’s not.